Richter's Marketplace is your local community connection for high quality foods, friendly service and great prices. 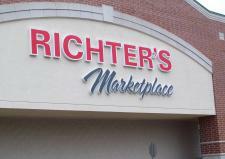 Richter's Marketplace has been a close-knit family affair since 1947. It all started when brothers George and John Richter started their first grocery store in nearby Twin Lakes. On May 2, 1947 they opened Richter's IGA Supermarket. In 1954, George bought out John's share and bought more property on Main Street to expand his store. In 1962, IGA changed to Sentry Foods. George and his wife Mildred then opened a store in Lake Geneva in 1965 (which was closed in 2005). The Burlington location was purchased in 2001. George Richter's sons Norm and Larry are the current owners of the business. Their children work and manage departments at the stores. A Strong Commitment to Community and Service. Through over 65 years of service, one thing that has never changed is our commitment to bring you the best. We are an independent grocer, so you can always count on us to truly listen to the wants and needs of our customers. We also believe in giving back to the community. In 1992, Richter's started "Funds for Friends". A community event. This is how it works: A non-profit organization can save their grocery receipts and turn them back in to the store for a 1% return of the total purchase price. In 2012, over $20,000 was distributed to churches, clubs & animal shelters. The Richter Family cares about family, tradition and their community. We are proud to be your community market. If you'd like to receive Richter's Marketplaces weekly ad via email, you can do so by providing us with your email address on our Subscribe Page.